Two Great Reasons Why Our New Shopsmith Abrasives Are More Productive and a Far Better Value Than Any Of The More Conventional Abrasives You've Been Using! #1: Better Backings -- Our new hand-sanding refills and random orbit discs both feature a revolutionary new plastic film backing that is highly resistant to tearing and edge wear while providing an ultra smooth surface with even grain coverage. In addition, they are treated with a special anti-clog coating that reduces particle build-up. As a result, the abrasive grains are exposed longer, which allows them to cut four times faster. Our sanding belts feature rugged, polyester-cotton cloth backings that resist tearing and last four times longer. Their bi-directional flush joints are reinforced with high tensile strength tape, providing heat resistance for maximum seam durability and smooth operation in both directions. #2: Ceramic Abrasives -- Ceramic abrasives are generally recognized as the toughest, sharpest abrasive materials available to today's woodworker. Compared with other abrasive materials, they are relatively new in the marketplace and offer some distinct advantages. First of all, ceramic grains run cooler than most other material. That reduces the build-up of heat that can burn workpieces can cause abrasive failure. Next, ceramic abrasives are sharper than other abrasive materials... plus, they are designed to fracture during use, creating new sharp points as work progresses. As a result, they cut much faster. Finally, ceramics are much tougher and far more durable than other abrasive materials... and that makes them a superior value ! 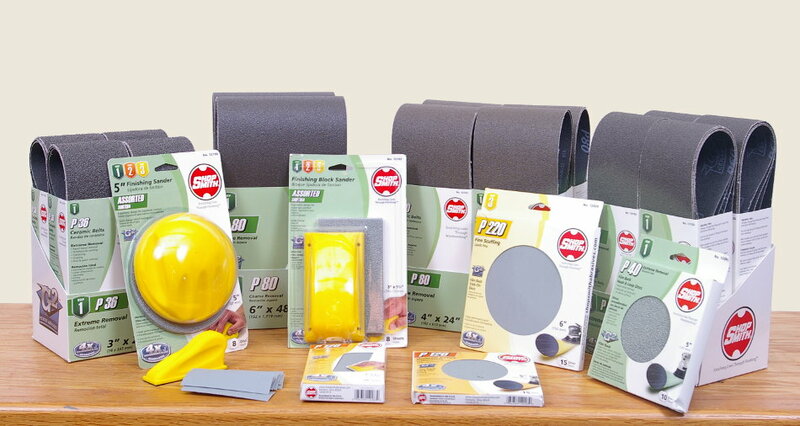 So when you think abrasives, don't think about how expensive ceramics are. Instead, think about how much easier your work will be - and what a better value they are to you in the long run.